We do not curently have theatre tickets available for Elvis Lives This could be because we have simply sold out or it could be that this show is no longer running. The information on this page remains purely for historical and informational purposes. For the first time in the UK - exclusively from Graceland  'ELVIS LIVES' is an unforgettable multi-media and live musical journey across Elvis' life. 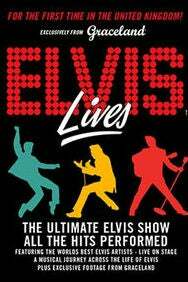 The show will feature a full live band and the hit songs will be performed live by three of the winners and finalists from the Elvis Presley Enterprises' worldwide Ultimate Elvis Tribute Artist Contest. Featuring exclusive Graceland footage. Don’t miss this phenomenal show. There is a maximum of 4 tickets per cardholder.